The lack of adequate quantities of organic seed is recognized as a weak link in organic production and has resulted in ongoing exemptions to the National Organic Program’s (NOP) organic seed requirement. While organic seed production is a developing industry and a viable economic opportunity for organic growers, there is uncertainty and risk. In particular, seed growers may desire mentorship in enterprise budgeting, record keeping, and marketing strategy. This training aims to help the industry to scale up organic seed production, increase the profits for growers, and build the supply of organic seed nationally through increasing growers' knowledge by making tools and examples available for enterprise budgeting, inventory management, foundation and stock seed planning, and contracting. Scroll down for links to many of the tools and watch the presentations from the 2018 Seed Economics Intensive at the Organic Seed Growers Conference. This seed enterprise budget tool was developed to guide farmers who are interested in knowing the costs associated with producing individual seed crops on their farms. Enterprise budgets provide a snapshot of costs associated with a single crop for a single year and do not make predictions or forecasts for future years. However, they can be used to provide guidance for farmers who are considering investments in new equipment, training, or scale. Sensitivity analyses can be done by entering different values for any variable in the production flow. Each value in the tool can be customized, though common default values are provided for some calculations in the current version. Sebastian Aguilar's presentation in Farmer Enterprise Budget Case Studies webinar recording below uses this type of tool. *For more seed contract examples, scroll to the bottom of this page to download contracts from Southern Exposure Seed Exchange and High Mowing Organic Seeds. 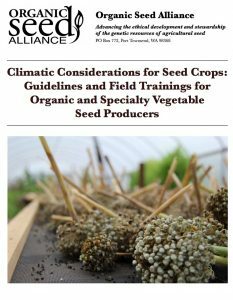 This guide provides detailed climatic considerations for organic and specialty seed production in the Pacific Northwest. Topics include environmental influences on pollination and fertilization, and the influence of temperature, day length, frost-free days, precipitation, and wind. The guide also includes sections on environmental management, crop selection for seed production, and the history and geography of seed production in the region. Common questions around foundation, stock, and production seed are: How much foundation seed do I need to ensure I have enough stock seed? How much stock seed should I produce every third year for my production seed? The Production Planning Tool for Seed Producers is a simple excel sheet that helps guide decision making around how much and how often to produce foundation, stock, and production seed based on your operation, desired inventory, longevity of the seed, and estimated yield. A blank template and a real-world example are included as separate worksheets. Navigating the financial challenge of growing seed commercially can be challenging and managing the risks are essential to success. Beginning and experienced seed growers joined the Organic Seed Alliance for this one-day intensive to explore tools for managing financial risk in commercial seed production through budgeting tools to evaluate capital investments, expand enterprises, and assess market opportunities. 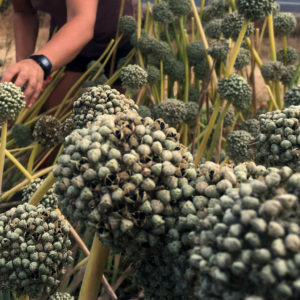 We examined real-world examples from seed growers with different marketing strategies to build knowledge of wholesale, retail, contract growing, breeding, and variety maintenance. Presenters had the opportunity to provide their own production examples and work with an agricultural economist to develop enterprise budgets. We also heard from organic seed industry representatives about gaps in the seed supply, best practices for quality control, and essentials for contracting with their organizations. Seed companies largest risk is embodied in their inventory. A failure to manage inventory is the number one risk for seed businesses. In this presentation, Tessa Peters of the Organic Seed Alliance discusses inventory management strategies including variety lifecycles, marketing as a retail business or a wholesale business, considerations for stewarded varieties, managing foundation, stock, and production seed, and forecasting. Sarah Kleeger of Adaptive Seeds gives a behind-the-scenes look at the inner workings of her seed company. She shares the business structure and the percent shares of each of the business costs. She gives insight into managing inventory at her scale including choosing varieties through trails and tastings, providing breeder liberties and intellectual property. Sebastian Aguilar runs a wholesale contracting seed business in California. He gives an inside look at growing crops on contract. Including establishing relationships with seed companies, quality expectations, dealing with cash flow challenges, and investments in equipment. Travis Greewalt presents an introduction to using the Organic Seed Alliance's Enterprise Budgeting Tool (linked below.) He discusses what enterprise budgets are designed to do and what they are not designed to do. Then he provides a case study of chard seed. Finally, he presents a sensitivity analysis for the chard example in which he provides different price points for and yield estimates for the example to show how an enterprise budget might be used in decision making for your farm. Tanya Murray leads a cost study cohort program with Oregon State University and Oregon Tilth. She presents ideas for tracking labor costs on-farm using time studies. Three farmers give real-life examples of how to use enterprise budgets to track costs for specific seed crops. Sarah discusses two squashes (Oregon Homestead Sweet Meat winter squash, Lower Salmon River Squash) and two peppers (Bacskai Feher and Korean hot peppers) using OSA's tool (linked below.) Sebastian presents a Wiswall-based method for lettuce and tomatoes. Sam McCullough presents on two varieties of chard, delivered at different seed cleaning specifications.